Yes, I authorize Saint Xavier University to contact me via text or short message service (SMS) at the phone number provided. Message & data rates may apply. Do you enjoy working with patients? Are you passionate about improving the quality of their care? Saint Xavier’s online MSN in Clinical Leadership will give you the tools and skills you will need to take an active role in assessing, improving, implementing, and evaluating patient care. 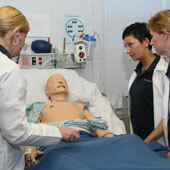 Our curriculum also prepares you for the Clinical Nurse Leader (CNL) certification exam. The skills and knowledge offered in this online nursing master’s degree program are applicable to most clinical settings including: hospitals, doctors’ offices, rehabilitation centers, hospices and Veterans Affairs Medical Centers. 1The online master’s nursing programs at Saint Xavier University are accredited by the Commission on Collegiate Nursing Education (CCNE), One Dupont Circle, NW, Suite 530, Washington, DC. 20036, (202) 887-6791.